I was reading an article this morning about a USA Today newspaper story concerning some famous athletes detailing their histories of mental illness. Some of the big names included the basketball great, Jerry West, the multiple gold medal swimmer Michael Phelps and the Giants receiver Brandon Marshall. Looking from the outside, the obvious question would be: how/why could incredibly successful people with amazing amounts of wealth, fame and recognition possibly be depressed? I have written numerous entries about the effects of chemical imbalances on weight control. Many of these involved chemicals that produce cravings, satiation, gratification etc. are brain chemicals. Serotonin is just one of probably an infinite number of chemical messengers that play a role in our mood and behaviors. 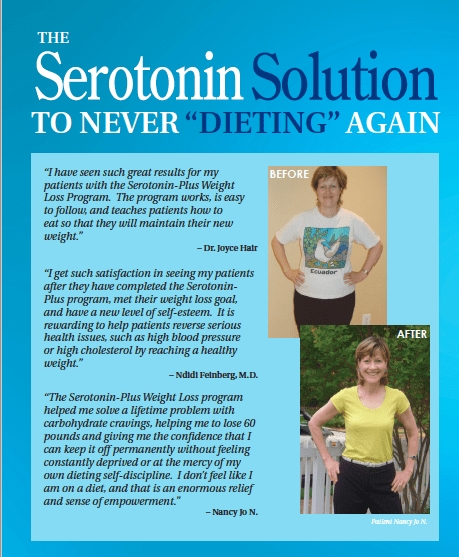 Serotonin has also clearly identified as a chemical involved in weight control, and once again, many other chemicals probably impact on both mood and appetite/eating regulation. We have all been in situations when our mood affects our eating behaviors. We certainly do not consider one day of a down mood “mental disease” but when there relatively prolonged periods of time when depression/anxiety symptoms dominate our existence, this most certainly may be considered “mental disease”. Unlike experiencing a physical disease, mental disease is frequently “hidden” from others because of the stigma attached to these conditions. Admitting to a mental disease is often self-viewed as a “weakness” of some sort and going to a physician for help is delayed or even not even contemplated because of the stigma. It is great when well known people “come out of the closet” to disclose medical/mental issues that they previously tried to hide from others. Sharing their experiences hopefully encourages the “average Joe/Josephine” to seek help. This help may also wind up helping weight control.